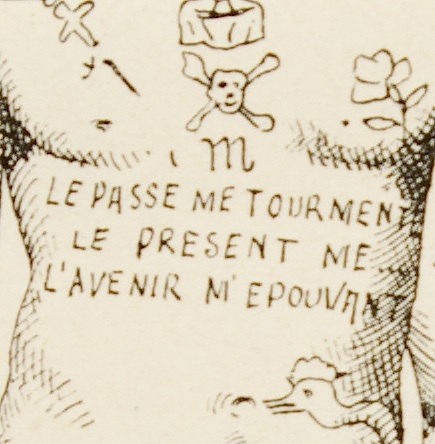 I always get a cheap thrill when I notice a tattoo motif referenced in two different historical academic publications. It makes me think of issues that range from shared scholarship to lazy research to plagiarism and that things are not that much different today as compared to years, even centuries ago. The quote differs slightly from Lacassagne to Lombroso, and that makes me wonder if both researchers were observing the same person, but one of the researchers just transcribed the motto wrong (or wasn’t paying proper attention to his sketches when drafting the drawings after the fact). It’s patently clear that these criminologists’ research findings were so problematically skewed because they were working with such specific populations (incarcerated or otherwise institutionalized men), but if they were working with such a limited group that both the Italian Lombroso and the French Lacassagne had to seek out the same man, their conclusions become even more appalling. The entire lingering stigma that tattoos are deeply connected to criminality and deviance comes from the writings of these criminologists, who patently ignored or dismissed the vast practice of tattooing going on on non-criminal bodies at the time. Goodbye my friend! Your funeral was the first of what I’m sure will be many sendoffs. This is one of my fave pics I’ve snapped of you with your coffee cup that says “Behind every successful man stands a woman...telling him he’s wrong!” Totally captures your sense of humor and your respect for women. You were raunchy, but always a gentleman too. Tattoo History Occasionally and Tattoo History Daily are labors of love. If you enjoy the posts, please consider a small donation to help support the project.